Working in a corporate office atmosphere doesn't always allow for much variation in your wardrobe. Essentially, nothing says 'in charge' or 'powerful' more than a business suit. However, it can get boring putting on the same basic pieces each day and only highlighting different color combinations. Fortunately, fashion designers are making their mark on women's business suits and changing them to meet the style demands of modern women by honing in on industry-wide trends and design elements. Keeping your professional wardrobe current and fun can seem like a full-time job on its own! 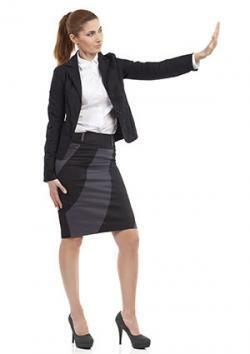 Trends change and add small updates to women's business suits. While traditional suits will always be considered to be 'in,' designers are also mixing fabrics to create a more non-traditional look. This is truly a trend for all seasons since it works year round. Gone are the days of buying suits together as a matching set; you can now mix and match pieces and fabrics to create a more authentic look for the office. Just be sure to choose pieces that bring together a complete suit because that is, and will always be, what's appropriate in the office. Calvin Klein Contrast Trim Jacket and Pencil Skirt (pictured) - This blazer features a contrasting trim, as well as a contrasting-colored pencil skirt to really make the details pop. It creates a sophisticated look that works perfectly at the office and showcases your personal style at the same time. Tahari ASL Pearl-Trimmed Skirt Suit - This beautiful skirt suit shows you how to truly rock the mixed fabrics trend while still being office appropriate. It features contrasting details at the neck and sleeves, as well as a beautiful beaded fabric. Traditional women's business suits focus around the colors black, brown, and navy. These are great colors to have, but consider them just basics. Designers are now combining different colors, such as black skirts with a red jacket, as well as using different colors within the jackets and skirts themselves. This keeps the wardrobe more interesting and exudes a modern appeal in your attire. Calvin Klein Two-Button Jacket With Neutral Skirt (pictured) - Calvin Klein is always on point with trends, and this bold blazer and neutral skirt combination shows how to properly vary color underneath a blazer in an office atmosphere. It's all about the layers! Boss Hugo Boss Jakely Panama Stretch Suiting Jacket - Huge Boss illustrates how to effectively mix together a cream-colored blazer with black pants in order to carry the variation color trend perfectly! Designers are using bold prints to bring attention to the otherwise more basic pieces in women's business suits. The proper way to flaunt this look is to choose one piece (blouse, skirt, or jacket) in a bold print, and then choose neutral colors for the other pieces. Your accessories should match the solid-toned pieces to keep the focal point on the bold print. Kasper Printed Jacket and Trousers (pictured) - The bold print in this beautiful suit is such a great example of this trend! The black pants let the jacket be the trendy pop of color that updates an otherwise traditional suit look. Halston Heritage Color Block Blazer - This bold Halston Heritage blazer perfectly combines neutral colors in a color block print to help you show off your fashion sense and still be office appropriate. While having a small waist accentuates this trend, it is a hot one nonetheless! The peplum should start at your high waist and then flair outwards. It's a great trend for someone who wants to accentuate her hips or simply step away from a more traditional silhouette. Due to the attention-grabbing outcome of this trend, designers are typically featuring this silhouette in basic colors. 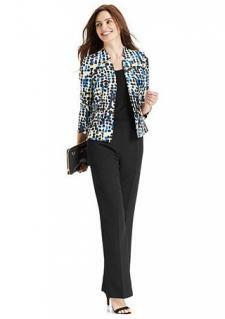 Escada Scuba Peplum Top - Escada is a true fashion icon for women's business suits! This peplum jacket is perfectly tailored and features a zip enclosure for a modern, everyday look. Topshop Slim Peplum Jacket - This peplum jacket from Topshop looks equally as good at the office as it does unzipped and paired with denim for the weekend. White is a beautiful and brilliant color to add to your work wardrobe and pair with darker skirts year round. While basic pencil skirts are always on-trend, designers are introducing a looser skirt called an 'urban' style. This new trend offers a loose-fitted silhouette that flares over the hips. When you try out this trend, make sure the suit is accompanied by a slim-fitting blazer to balance out the looseness of the skirt. Ann Taylor Pindot Flounce Skirt - This is a great example of an urban skirt that has a soft pattern on it for a more conservative office. This is a great wardrobe addition that flatters many different body shapes. If you are on the tall side, though, you might want to avoid something this short for the office or have the hem let down an inch. J. Crew Patch Pocket Skirt - The perfect skirt for taller women, this is a more relaxed skirt for the office that exudes both a business casual and comfortable vibe. It is also perfect for women who don't love the constricted feel of a pencil skirt. No matter which season it is, designers are honing in on skinny, tailored pants for the office environment. These pants come in a more fitted silhouette and almost appear to be cropped, as they hit right at the ankle. Some silhouettes are skinnier than others, but there are options for a looser fit that still falls into this trend category. When choosing a suit that highlights skinny pants, opt for an ensemble that includes a well-tailored jacket or fitted peplum embellishment. Theory Louise Urban Pant - Theory is known for having impeccably tailored business attire, and these pants are one of their strongest pieces. They are a great example of skinny pants of the looser variety, which work for many different body types. J. 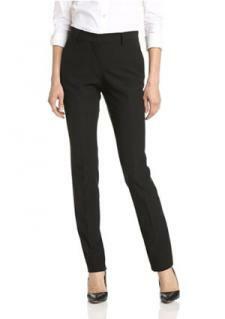 Crew Paley Pant - These skinny pants from J. Crew are of the slimmer variety. They come in neutral colors, which makes them a very office-appropriate wardrobe staple for years to come. While the world of fashion is constantly evolving, women's business suits are staples that remain the same for long stretches of time. Looking back, women will still pay a fortune whenever they walk into a vintage clothing store and come across the classic Chanel women's business suit because its classic look never goes out of style. However, paying attention to small details and updating pieces periodically will keep you current and on-trend at the office.